The Congress Chapter of Central New York, established in 1975, is a not-for-profit organization. The goals of the Congress Chapter are to promote a wider appreciation and greater awareness of local and regional brewing history through the collecting of brewery advertising. 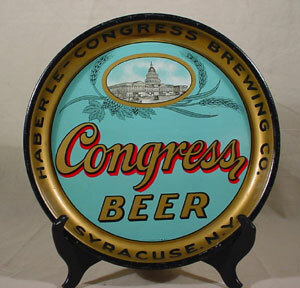 We adopted our name and logo from the Haberle-Congress Brewery in Syracuse, NY. The Haberle-Congress Brewery operated on the corner of Butternut and McBride from the mid-1800's until 1962. The brewing industry was vital to the growth of the city of Syracuse, making it at one time the brewing capitol of the northeast.